MIT researchers have developed a way to dramatically enhance the sensitivity of nuclear magnetic resonance spectroscopy (NMR), a technique used to study the structure and composition of many kinds of molecules, including proteins linked to Alzheimer’s and other diseases. Using this new method, scientists should be able to analyze in mere minutes structures that would previously have taken years to decipher, says Robert Griffin, the Arthur Amos Noyes Professor of Chemistry. 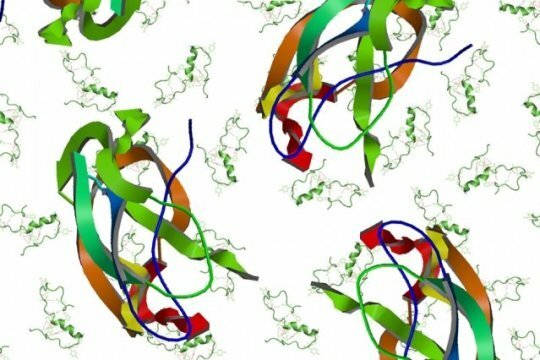 The new approach, which relies on short pulses of microwave power, could allow researchers to determine structures for many complex proteins that have been difficult to study until now. “This technique should open extensive new areas of chemical, biological, materials, and medical science which are presently inaccessible,” says Griffin, the senior author of the study. MIT postdoc Kong Ooi Tan is the lead author of the paper, which appears in Sciences Advances on Jan. 18. Former MIT postdocs Chen Yang and Guinevere Mathies, and Ralph Weber of Bruker BioSpin Corporation, are also authors of the paper. Traditional NMR uses the magnetic properties of atomic nuclei to reveal the structures of the molecules containing those nuclei. By using a strong magnetic field that interacts with the nuclear spins of hydrogen and other isotopically labelled atoms such as carbon or nitrogen, NMR measures a trait known as chemical shift for these nuclei. Those shifts are unique for each atom and thus serve as fingerprints, which can be further exploited to reveal how those atoms are connected. The sensitivity of NMR depends on the atoms’ polarization — a measurement of the difference between the population of “up” and “down” nuclear spins in each spin ensemble. The greater the polarization, the greater sensitivity that can be achieved. Typically, researchers try to increase the polarization of their samples by applying a stronger magnetic field, up to 35 tesla. Another approach, which Griffin and Richard Temkin of MIT’s Plasma Science and Fusion Center have been developing over the past 25 years, further enhances the polarization using a technique called dynamic nuclear polarization (DNP). This technique involves transferring polarization from the unpaired electrons of free radicals to hydrogen, carbon, nitrogen, or phosphorus nuclei in the sample being studied. This increases the polarization and makes it easier to discover the molecule’s structural features. DNP is usually performed by continuously irradiating the sample with high-frequency microwaves, using an instrument called a gyrotron. This improves NMR sensitivity by about 100-fold. However, this method requires a great deal of power and doesn’t work well at higher magnetic fields that could offer even greater resolution improvements. To overcome that problem, the MIT team came up with a way to deliver short pulses of microwave radiation, instead of continuous microwave exposure. By delivering these pulses at a specific frequency, they were able to enhance polarization by a factor of up to 200. This is similar to the improvement achieved with traditional DNP, but it requires only 7 percent of the power, and unlike traditional DNP, it can be implemented at higher magnetic fields. With this improvement in sensitivity, samples that would previously have taken nearly 110 years to analyze could be studied in a single day, the researchers say. In the Sciences Advances paper, they demonstrated the technique by using it to analyze standard test molecules such as a glycerol-water mixture, but they now plan to use it on more complex molecules. One major area of interest is the amyloid beta protein that accumulates in the brains of Alzheimer’s patients. The researchers also plan to study a variety of membrane-bound proteins, such as ion channels and rhodopsins, which are light-sensitive proteins found in bacterial membranes as well as the human retina. Because the sensitivity is so great, this method can yield useful data from a much smaller sample size, which could make it easier to study proteins that are difficult to obtain in large quantities. The research was funded by the National Institutes of Biomedical Imaging and Bioengineering, the Swiss National Science Foundation, and the German Research Foundation.